Lately, my family seems to always have granola in the house. 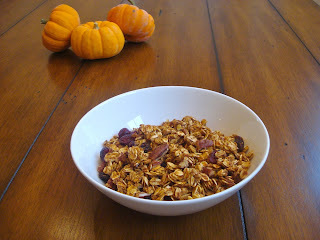 Ever since I first made Fruit & Nut Granola, I've made a batch of it almost every weekend! It really is good, and it's fun to switch up the add-ins with every batch I make. This week, I decided to switch it up even more and make pumpkin granola! It seems like there are SO many pumpkin recipes popping up on the internet these days, and I'm not complaining! I love pumpkin...it's definitely one of the fall flavours I look forward to most. 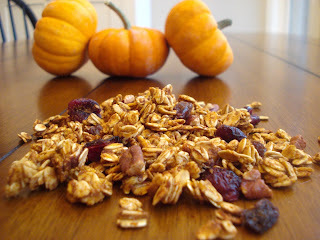 Pumpkin pie, pumpkin bread...why not pumpkin granola! Another thing that's great about this granola is that it's a bit healthier than your regular granola because there's no oil. The pumpkin puree acts as a binder, so you don't really need it. Which is good...because a healthy breakfast means that you can eat more of that fall comfort food we all love. It all evens out. 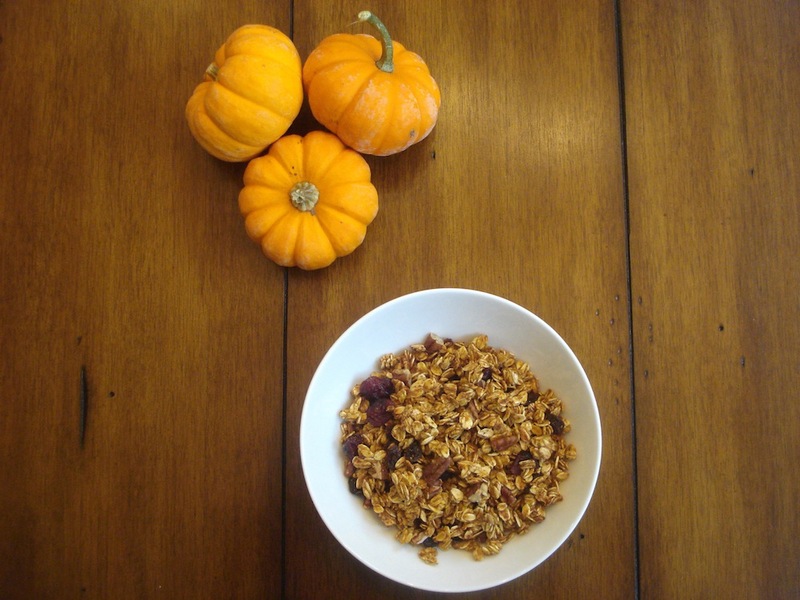 In a large bowl, combine oats, cinnamon, nutmeg, ginger, cloves, salt and pecans. Stir to combine and set aside. In a separate bowl, combine pumpkin, brown sugar, applesauce, honey and vanilla. Mix well, then pour into bowl with oats. Stir until all of oat mixture is coated, then pour onto two baking sheets lined with parchment. 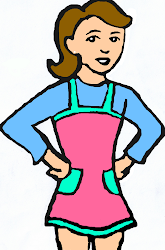 Bake in preheated oven for 20 minutes, then stir and bake another 20 minutes. Enjoy the granola...and the amazing smell that will fill your house!